Originally published November 2006, this book still resonates. Essential reading. Featuring extensive quotes from National Party sources, Nicky Hager’s The Hollow Men: A study in the politics of deception exposed and excoriated a cynical, deceptive team of politicians, spin doctors, professional deceivers and behind-the-scenes, shadowy political donors seeking political influence and ‘policy for sale’ — some of whom, judging by results, are still very much connected. It is interesting (read: disgusting) to read some of Matthew Hooton‘s never-intended-for-publication manipulations verbatim. Although he has his moments, e.g. voicing opposition to the racist overtones of National’s vacuous ‘race-based privilege’ theme, overall he comes across very badly in the book, in my view. Others may disagree. After reading an exchange between Matthew and Don Brash’s strategist/advisor Bryan Sinclair: a self-congratulatory mutual gloating about how they duped church-going Christians in the service of Brash, Blumsky and Banks,1 and other toxic tactics, I will never take Hooton’s feigned outrage about ‘corruption’ in politics and his breathless, hysterical Helen Clark-bashing remotely seriously again. The irony that now, SEVEN YEARS after the dodgy election spending machinations that Matthew Hooton and the gang engaged in for the National Party/Don Brash campaign (which the Hager book documents) — like the ‘third party’ spending by the Exclusive Brethren, the Racing lobby, the Maxim Institute etc — all FAILED, one of the machinists has the gall (or total lack of self-awareness?) this week to foam: “In 2005, despite clear warnings from the authorities, Labour deliberately broke campaign spending laws, believing anything was justified to hold on to power”. If I infer correctly, it’s just hard to believe the guy is so wonky, shonky and shameless. Likewise, former Dominion political columnist and editor Richard Long’s, let’s call it, ‘shift in focus’ gives substance to the classic journos’ rueful joke about how former colleagues ‘Go over to the dark side’ when they cross the bridge. I remember Richard Long with something like affection and respect from my brief (compared to his) stint in the press gallery. The examples in Hager’s book of Richard — acting as Brash’s chief of staff — deploying calculated obfuscation, preparing dodgy, layered ‘lines’ and tactics to finesse the media and obscure the truth about aspects of the Brash campaign, are disturbing. Don Brash et al on a ‘Path of Principle’? Oh dear. Gee, Richard. The subject matter is the dark and sometimes ugly side of politics. 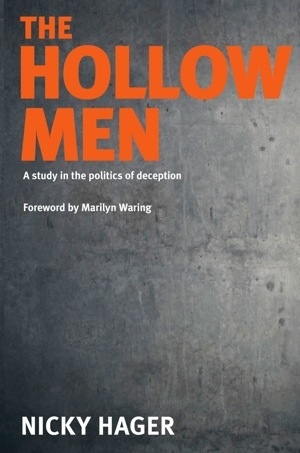 The Hollow Men exposes the undergarments of political strategy setting, implementation and election campaigning. Many of its insights apply not only to the National Party but probably to modern politics in general. I also appreciated (and spent quite a lot of time in) the information & discussion contained in the quoted source documents and ample end notes. This, from chapter 16 note 37 addresses the ‘big O objectivity’ topic we discuss on The Paepae now and then. Public discussion of journalism usually revolves around the idea of objectivity, where journalists are supposedly neutral purveyors of news without opinions or biases of their own. in reality, some journalists do appear to be without opinions or biases of their own, but they are not usually the best journalists. A more realistic approach is to accept that there is nothing wrong with journalists having personal political beliefs and biases as long as they are aware of them and still do a professional job, including fairness, accuracy and avoiding conflicts of interest. Yeah, that would be good. For myself, I’ve observed that in NZ’s very small media market, with some media players — particularly radio talkback hosts — partisan and ‘actively sympathetic’ (as Hager documents) … along with thin-skinned politicians and their ‘advisors’ so willing to bear grudges against individual journalists (as he also documents, peripherally), Hager’s suggested “realistic approach” is, I think, perhaps a touch idealistic. It’s worth keeping in perspective about the ‘dark arts’ aspects of Nicky Hager’s tale of the ‘Re-branding of Don Brash’. No-one, surely, thinks these practices are confined to the political right? Nor is the dynamic (cough) Simon Lusk the only murky spin doctor/campaign strategist (hoik) around town. I’ve mentioned other gifted amateurs here in ‘I’d double-check if they told me what day it was‘. One could also probably never overstate the slippery influence National’s svengali and political game-player Murray McCully has had over the years. 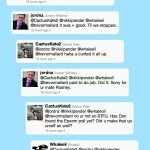 Actually, as a sidebar, it was interesting recently to note the utter contempt with which former ACT supporter Cathy Odgers regards sorcerer’s apprentice Jordan Williams, Simon Lusk’s boy wonder/lovely assistant on the shadowy Anti-MMP campaign. it was v good. Til we stopped. haha u c*nted it all up. *Ouch! * That’s hardly a recommendation! Read the conversation (bearing this earlier question in mind: ‘Is eavesdropping on Twitter really news?‘) and you may agree with me that Cathy seems clearly NOT impressed with the Williams/Lusk Hollow Men-esque tactics. … were used to undercut, and eventually, roll Hide. Cathy has previously indicated her own rather dim view of Matthew Hooton. See: ‘With one swift blow, Kate knocked the wind out of the duplicitous toady …‘. More things I would not say. The malevolent Ricketts plan for ‘The Defeat of Barack Hussein Obama’, which spilled into the public domain recently in all its glory, shows this dark arts stuff is all still a-happening. Likewise yesterday’s ‘Union puppet’ anonymous texts. Dirty tricks. But campaign dirty tricks aside, PR, political lobbying, interest groups, unseen pressure from ‘supporters’, and donations with (implicit) strings attached are rife in politics. Wake up and smell the coffee. As sorta-kinda an exception, I recall recently seeing former Labour Party president Bob Harvey in the context of discussion about lobbying in NZ, saying he funded his own mayoral campaigns because (paraphrase:) I knew that if I accepted a donation from somebody I could be damn sure they’d be in my office within three months of the election looking for a favour. It [Labour’s campaign committee] received reports on the search for an advertising agency willing to risk its reputation by associating with the Labour Party. It supervised what we called data research, the mostly amateur polling by which the party assessed which marginal seats offered the best return for its limited resources. There was some money for more sophisticated research. Its results helped tailor not the party’s policy but the way it presented its policy to capture the attention of the few thousand voters in the marginal seats who would decide the election. — At The Turning Point, Margaret Pope, 2011 p61. That, it seems to me, is a less-fraught description of some of the polling analysis Nicky Hager describes Crosby|Textor driving through the deceptive Brash 2005 campaign for National (an MMP election, by the way.) The goal: to capture the attention of swing voters and tailor how the ‘message’ was presented. It’s pretty hard to argue with a political party’s right to do that, unless they get into the ghastly character assassination tactics and misleading subterfuge which that campaign team stooped to, according to Hager. And … National being a party of business and wealthy interests, with the frustrated hard-right Business Roundtable etc funding them with one aim: to get Saint Don of the Hidden Agendas elected … one can imagine that perhaps National’s pollsters had a bit more money at their disposal? 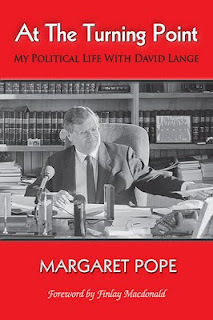 Hager’s very convincing book makes the argument that promoting negative, divisive, or empty slogans (‘combatting political correctness’, ‘mainstream NZ’ and ‘ending Maori privilege’) and slandering your opponents (‘wasteful, arrogant, corrupt!) in place of offering genuine policy makes you hollow — and, incidentally, sadly, it makes you a team of liars, especially if in so doing, you pretend to be promoting the ‘non-politician politician’. If it is, we’re in trouble. 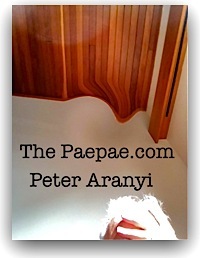 – Best wishes, Peter Aranyi © 2012 All rights reserved.